Michael is leaning against the fence of Callum’s front garden. He’s been waiting here for about 20 minutes, as Callum had to eat dinner with his family before he is allowed out. During their last lesson of the day, Michael had suggested that the two of them head over to the playing fields close to where they both live. The front door opens and Callum steps outside. “Sorry, mom’s being a bit of a pain again” Callum offers up, hoping his friend isn’t annoyed with him. “No problem”, Michael replies, “I didn’t realise you live next to Sophie, I spotted her in the window up there.” He motions up to a window with light streaming out of it. “Oh yeah, I don’t really talk to her”, Callum explains, “She’s a bit weird; sits in the garden reading and talking to the flowers”. The two boys started to walk down the road and cross over to the playing fields. There are a few football pitches, a skate-park and a children’s playground. As the two friends walk on to the grounds, they hear the sound of boys laughing and talking very loudly. When Callum notices the source of the chatter he stops and turns to Michael; “I don’t want a run-in with Thomas and his gang, let’s leave”. “Don’t be silly”, Michael scoffs, “they’re all the way over there”. Callum pauses, looking around, thinking of a way to avoid the boys that bully him at school. “Come on scaredy pants, lets go into the woods. See if we can find a good spot to show the girls.” Michael winks. The two boys head for the woods that border the playing fields and almost surround the housing estate. As they progress deeper into the trees, the sounds of the bullies along with the light starts to fade. “Come on, You’ve been doing his homework from the first day of secondary school”, says Michael. Michael nods, deciding to end the conversation before his friend becomes too upset. He bends down and picks up two sticks, then throws one over to Callum. Not expecting this, Callum catches the stick surprisingly well, prompting the two boys to lunge at each other making high-pitched noises as if wielding light-sabres. After a few duels with dramatic death scenes – one of which Callum wins – the boys throw their imaginary weapons to the ground and continue to walk along the beaten path. “You know, I think you’ve got it wrong about Sophie” Michael offers. “I reckon she’s into me”. “What makes you think that?” Callum asks. “Well… When I was waiting for you, I noticed the light turn on, so I looked up.” Michael pauses “She appeared in the window, looking a bit sad. as she looked around she noticed me looking up at her, she smiled, and blew a kiss at me.” Michael smiles slightly embarrassed about what he just shared. “So thats why you want to come over here, your gonna ask her to come for a ‘walk’” Callum winked. Michael turned away looking for a reason to not respond, and notices an overgrown track winding off the main path and stops abruptly, making Callum bump into him. Without saying a word, he changes direction towards the mysterious off-shoot and quickens his pace. “Erm… Michael. Where are you going? The path goes the other way.” There is an unmistakeable anxiety in Callum’s voice. Looking ahead of where Michael is pacing. The trees seemed increasingly dense and it’s very dark. “Shouldn’t we be heading back? It’s getting dark”. The two boys head deeper into the woods. Despite Michael’s assertions, time is also moving on. It’s later than the boys think. “Aren’t you glad that we came looking in the woods instead of having a run in with Thomas?” says Michael. “Yeah”, replies Callum, momentarily distracted from his surroundings, “But I can’t wait ’til the tables turn and someone teaches him a lesson”. “You know, Thomas isn’t as liked as he thinks he is” adds Michael. “What do you mean?” replies Callum. “Hey, what’s that?” Michael stops suddenly. Hidden in the darkness, amongst the dense trees, stands a lonely stone building. The two move closer to the building, Michael in the lead, and Callum following cautiously behind. The structure looks abandoned. 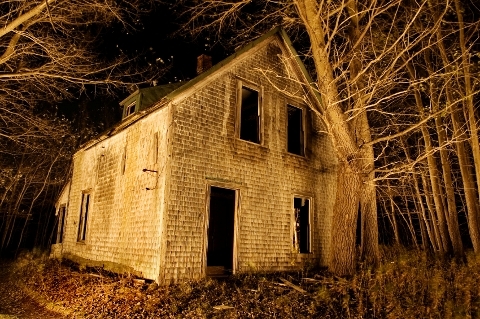 The area around it is overgrown, all the windows are boarded-up, and a pitch-black door marking the entrance. “Let’s go see if the door opens” the excitement was obvious in his voice. “Let’s sit down over there”. Michael walks over to a spot a few steps away from the front door, then sits on the floor. “Well? come on!” patting the floor next to him. Callum moves slowly over to sit next to his best friend. Michael turns to him “You know when we walk to school every morning and we pass the bus stop by Ermingwood drive?“. “Well, you know that old woman with that large maroon handbag and the hat with the dying flowers on top? I bet she lives here”. “I don’t know,” Callum replies, thoughtfully, “That’s pretty far for her to walk to catch the bus, and it doesn’t look like someone actually lives here.”. “That’s what so perfect about it,” Michael replies, “a ‘witch’ wouldn’t want to live in populated area”. “A witch? You’re having a laugh!” Callum shakes his head in disbelief. “No I’m not,” insists Michael, “Remember Johnny? I heard that he bumped into her one day, knocking one of those horrid looking bags off her shoulder. The next day, Johnny fell from his skate-board and broke his leg. Just before it happened, he told Eric that he noticed that the old woman’s eyes turn red as she looked back at him while muttering something”. “Johnny wasn’t that good on that skateboard anyway” says Callum. Although he was sure Michael’s story was made-up, there was still something about their surroundings that unnerved him. “Yeah, who would that be?” Michael asked. “Fenris! The gym teacher?” asks Michael, somewhat confused. Michael laughs, “Fenris? a ‘werewolf’?, what have you been smoking?!“. “Seriously,” Callum continues, “remember when he took off his shirt? hairy as hell! He’s also got that mean temper”. Callum looks his friend directly in the eyes, “I reckon when it gets close to the full moon he comes here to lock himself inside, trying to keep the werewolf secure”. Seeing that Michael still does looks convinced, he added “Explain the wolf howls? wolves aren’t indigenous to Wolverhampton”. Looking back at the house, Michael notices a sign for land development. “I’ve got one that you’ll really loooove.” Michael “its a man that went insane and killed his family and buried them were we are sitting right now.” Michael. “Wait, isn’t that the plot of poltergeist movie?” Callum. A load click echoes from behind the door and startled the two boys, with a creak the door begins to open. The boys immediately jump to their feet and run, back the way they came.